"Reversion to the mean is the iron rule of the financial markets" – John Bogle. Last week it finally happened; the US Yield curve inverted (i.e. interest rates for longer-dated bonds went below those of shorter-dated ones). 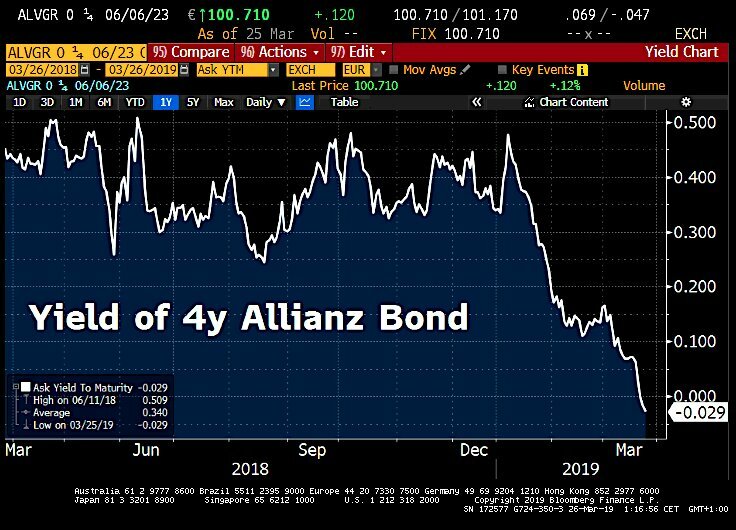 The rates available on 10-year bonds are now the same as those of 3-month bonds and the premium for investing over 30 years is now just 0.38% per annum . As the chart below shows, market expectations for interest rates now expect declines rather than rises in 2019. Last week, equities sold off sharply as recession fears intensified, amidst a big slowdown in Global Trade. We have been here (or somewhere close to here) before, though in slightly different forms - but it all amounts to a tendency of markets (or more specifically market pundits), to extrapolate recent events or trends endlessly into the future. Almost exactly one year ago, we wrote about how markets were concerned about rising Global growth (and thus Inflation) and again in August last year, warning about the dangers of assuming perpetual growth in FAANGs stocks. Both showed that markets were expecting the future to be a continuation of the present; concern is now rife that we are heading for a recession, with all the negative consequences thereof. The cause of this angst has been the Fed - in the space of a few weeks, it went from bullish on growth, (and thus forecasting further interest rate rises) to what looks like panic - 11 of the 17 Governors now expect NO rate rises in 2019, and a majority expect just one hike in the next 3 years. In addition, the Balance Sheet unwind (Quantitative Tightening) will end in October this year. The effective neutering of the Fed by markets now confirms that the US Indices have become the driver (and ultimate verifier) of economic policy decisions. Is it a coincidence that this shift gain has once again occurred shortly after a near 20% fall in the S&P 500? It seems that the equity markets are "too big to fail". Financialisation of the economy is complete, with all that entails for the populace, as asset prices are deemed too important to be left to investors. 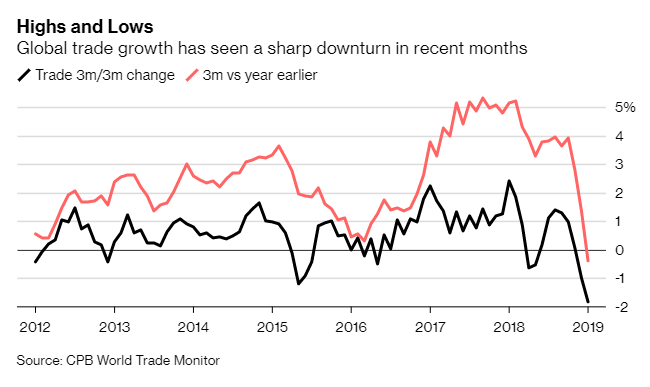 The growth "scare" is, however, global, with Asia also seeing the effects (with the on-going drag of the US/China trade war clearly affecting sentiment). Europe too has seen a sharp drop off in economic "surprises", (below) and German consumer confidence has followed. German Corporations once again no longer need Banks to fund business. But before one dons the tin-foil hats and stocks up on cat food, further consideration is necessary. NOTHING is written in stone - the number of Yield curve inversions are too small in number to constitute a meaningful data set . A curve inversion happened in 1998 and a 20% ish fall was then followed by no recession and a 50%+ surge (into the Tech bubble). Even when the curve inverts, it does not signal an immediate recession - things take time to progress. Nonetheless, second-order thinking is needed here - let us imagine that a recession actually happens - will the Fed stand by and watch? Will they say, "well, our economic policies over the last decade have clearly failed - spoiler alert, they have - so we shall let the chips fall where they may?" What about the ECB or the Chinese? Will they decide to allow a major stock market decline? Not a chance. All the stops will be pulled out, including Interest rate cuts, ZIRP re-implementation and if necessary, QE4 will be launched to flood the world economy with cash once again. 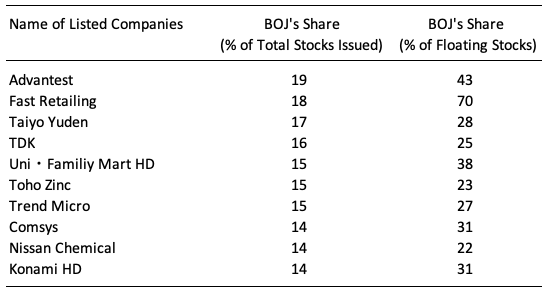 If that fails, the next step is Japanification of bond and equity markets, whereby the Bank of Japan now owns large chunks of the stock market (around 4% of the whole stock market - and rising). Central Banks care only about NOT doing 2007-09 all over again - period. The scale of the moral hazard thus unleashed will be monumental but that will be seen as a problem for another day (or more likely another Fed Chairperson). It is possible that markets are not, in fact, discounting a recession at all, merely the reaction function of the Fed, as it decides that it is not willing to take the blame for any slowdown that does occur, which if Trump has his way, they most certainly would! It may also be a reflection of "capital flight" into the US Dollar (the Dollar Index is up 2% in a week) - given the world situation (both economically and politically), institutions may have decided to "park" their money in the US, to await more clarity. We are also coming up to the Quarter-end rebalancing process; after a stellar Q1, US pension funds will need to buy bonds, (and possibly sell equities too), which may have contributed to the curve inversion (as, for duration matching purposes, they would be buyers of 10-years bonds rather than the shorter-dated equivalents). So the most likely outcome is not what pundits are currently predicting. So, what should we do? Nothing; part of the reason for the market's continued resilience is the constant stream of short sellers trying to fight the market (and the Fed), as we touched on last week, and there is no sign of that changing - indeed many see the current situation as another chance to profit from selling short, which of course means the opposite. The current hysteria will no doubt be replaced by something else soon enough. One thing that IS a concern, however, is the declining level of liquidity as shown below. This is also a global trend, mirrored as it is in all major asset classes and suggests that investors would be well served to steer clear of "exotic" (i.e. illiquid) assets and not be tempted to "overreach" for returns. Liquidity (to sell) often disappears at the very time one needs it most and it is by no means clear that investors see a return commensurate with those risks. Why would anyone buy 10-year bonds at the same rate as those of 1-year bonds? Because they expect a recession, which would lower rates for all maturities and they want to "lock in" that rate before it falls even further. This 3 month - 10-year inversion (which is believed to be the Fed's preferred indicator) has happened just 7 times since the 1900s. Implementing EBI Portfolios initially saved our business three days a month, plus beefed-up the robustness of our investment proposition. With the development of Vantage removes the very time-consuming process of re-balancing, making certain all clients get the same expected investment experience and an investment process which allows me to sleep at night.